Slight adjustments to the forecast, mainly to speed up timing of the arrival of rain and storms overnight by a couple hours. We are still in an Enhanced Risk (category 3/5) of severe weather overnight with the primary risk being damaging wind. An isolated tornado or hail storm can't be ruled out. 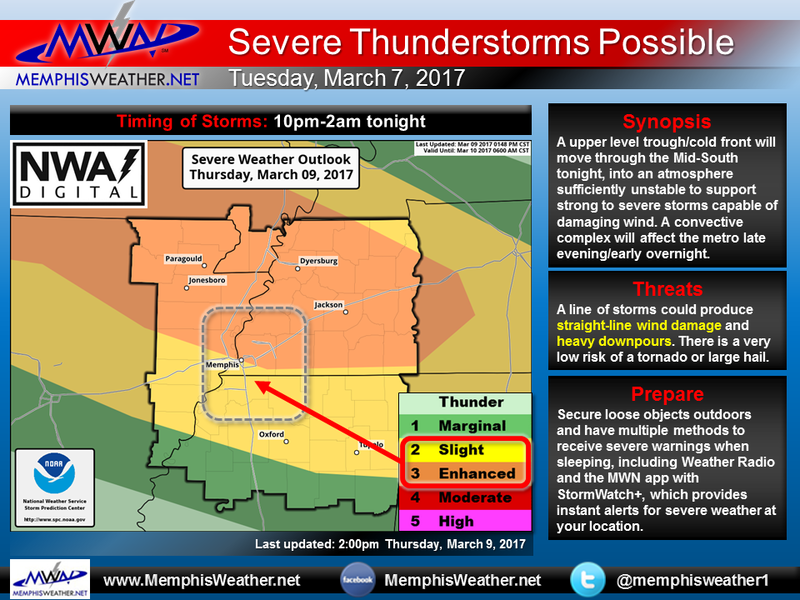 Make sure you have ways to get severe weather warnings when sleeping - we recommend StormWatch+ in the MemphisWeather.net app. 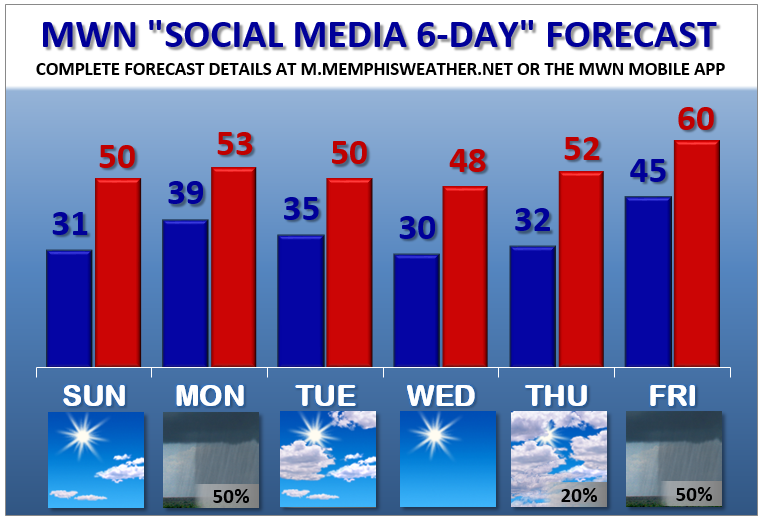 For tomorrow, the cold front arrives in the metro between noon-2pm. A few storms are still possible during that timeframe though more widespread, and stronger, storms will occur to our east during the afternoon. 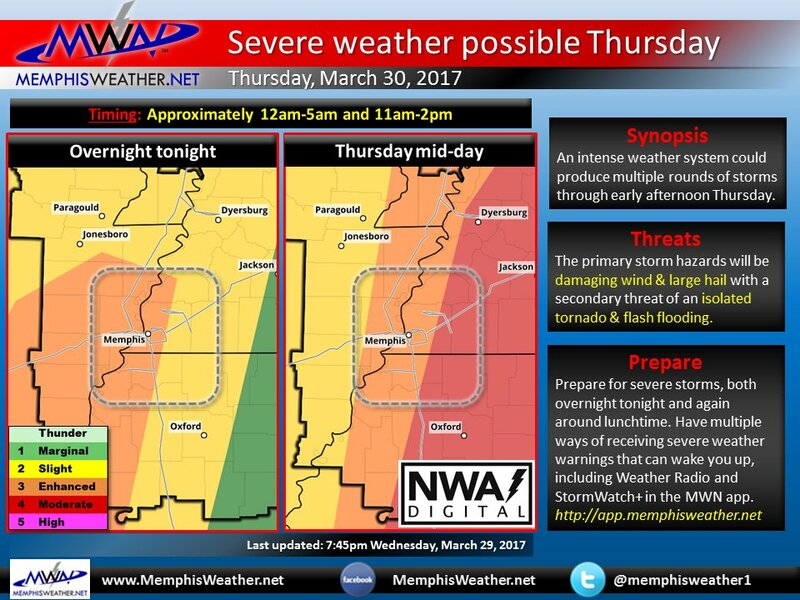 An Enhanced Risk of severe weather is also forecast for tomorrow. That could change overnight (we expect a downward trend if it changes at all). Behind the front, no additional rain or storms are expected. Have tickets to the Redbirds/Cardinals exhibition? Leave the umbrella at home and go enjoy it! An active weather period continues on Thursday with the next in a gravy train of low pressure systems that have affected our region over the past week or so. After this one, we'll get a break for a few days again, leading to a nice spring weekend (or most of one). But on to pressing matters! 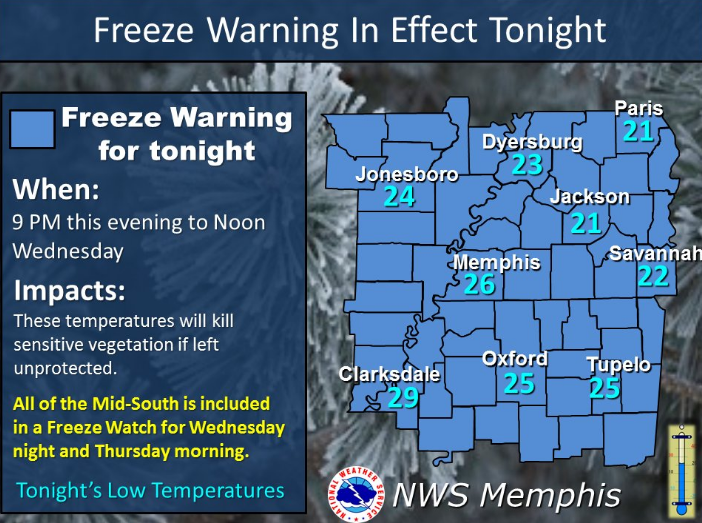 Two rounds of weather are expected to affect the metro on Thursday as a strong low pressure system slowly moves out of the eastern central Plains into Missouri and a cold front slices across the Mid-South. 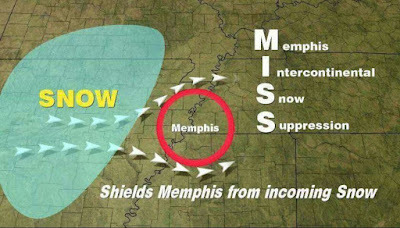 Storms will fire up and move east across Arkansas this evening, reaching the metro in the wee hours Thursday morning. This batch of storms is expected to affect the metro sometime between 2am-9am. The wide window is due to multiple short-term models indicating different scenarios playing out and overall low confidence in any of them right now. The best chance of rain and storms is likely between about 3-6am though. This initial batch brings the primary threat of damaging wind, though some hail and an isolated tornado are possible depending on how the system evolves. A morning lull in activity will allow the atmosphere to renew the destabilization process. Any sunshine in this period would be unwelcome. Warming near the ground is fuel for storms that we call instability. The more there is, the more likely subsequent storms will be stronger. By late morning or lunchtime, we'll likely start to see new cells form over or just barely west of the metro. I expect that they will quickly strengthen, but that will depend on just how much "renewal" the the atmosphere entertains before then. Between 12-3pm, a few storms will move across the metro and could be severe. I say "a few" because this isn't going to be another big line that affects everybody. You may not see any PM storms. 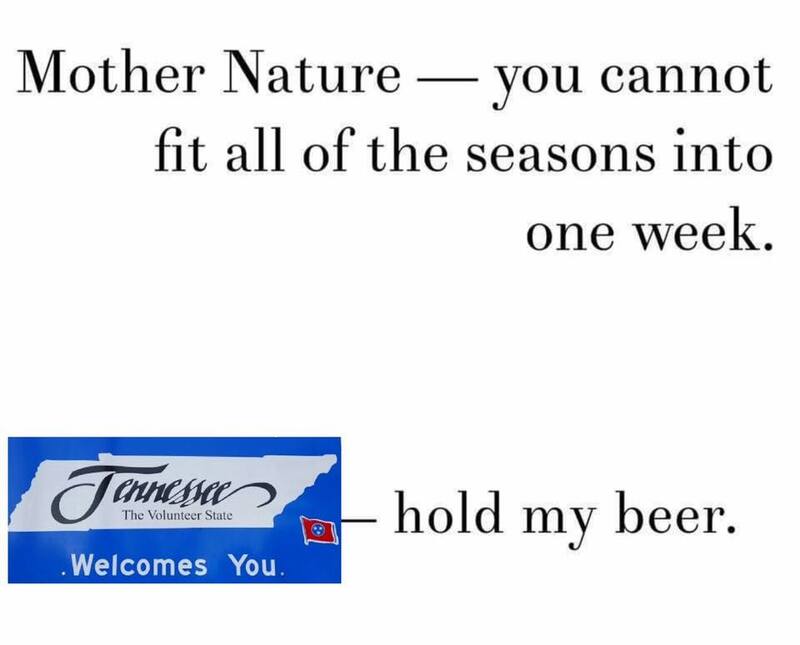 "A few" is also code for "possible supercells." Supercells can produce large hail, damaging wind, and and tornadoes. 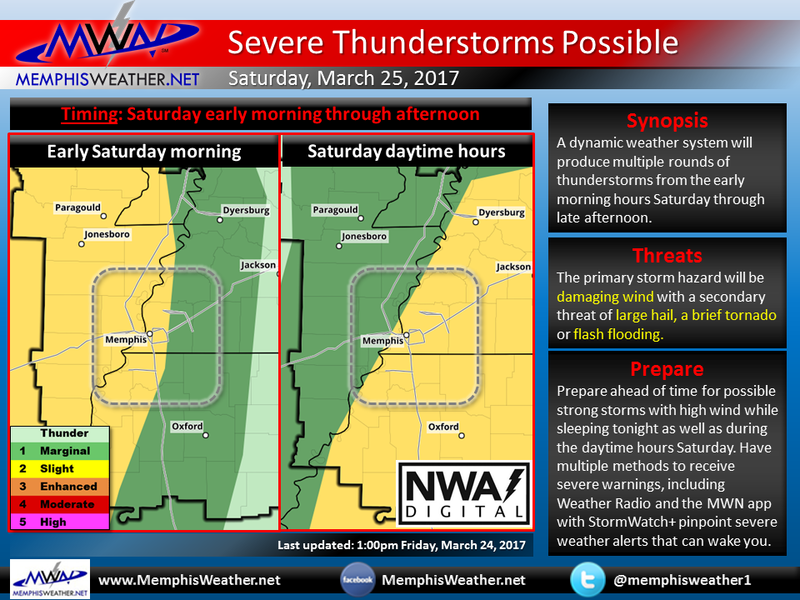 I believe the highest threat of severe supercells is east of the metro as the storms continue to develop moving across west TN and north MS. However, with enough instability and the right timing, a few storms could explode over the metro and produce hail, high wind, or a tornado. The good news is that threat quickly shifts east of the metro by about 2-3pm and the severe weather threat ends for the day. 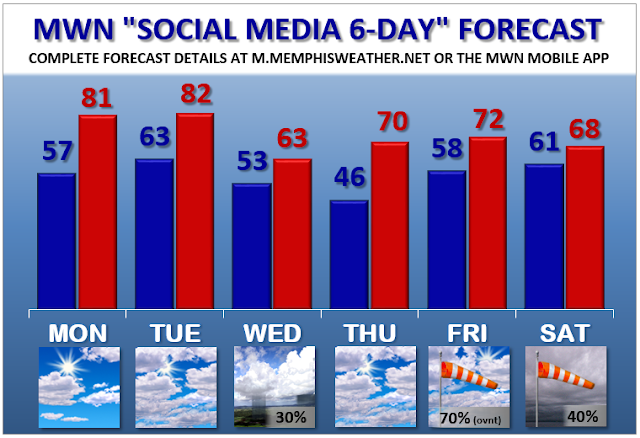 That's good news for most school dismissal times, rush hour travel, and of course the Memphis Redbirds exhibition against the St. Louis Cardinals tomorrow evening. The evening hours should be pretty pleasant weather-wise! As always, please prepare yourself, your families, and anyone else you are responsible for for the possibility of severe weather overnight and early tomorrow afternoon. Check back for updates to the forecast as timing COULD still change, which could necessitate changing how you prepare and respond. We highly recommend downloading the MemphisWeather.net mobile app and adding and setting up StormWatch+ in the app, which will allow you to receive push notifications as soon as watches or warnings are issued for your SPECIFIC location(s) of interest. 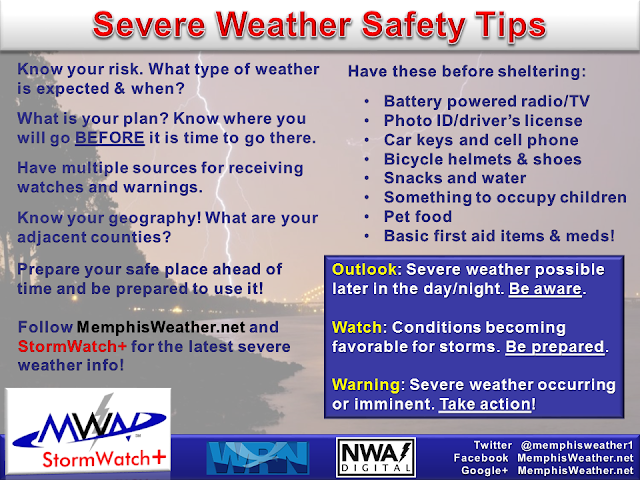 You also should have another method or two of receiving severe weather info, such as NOAA Weather Radio and radio/TV. I'm planning a live update on Facebook tonight about 8pm. Tune in via the link to our Facebook page below and have your questions ready! Also check our social media links for the absolute latest information throughout the next 24 hours or so. Severe weather season appears to be starting as the Mid-South enters what looks to be a busy couple of weeks in the thunderstorm department!As always we take them one by one, and the first hazards appear tomorrow. Unfortunately, this doesn't appear to be a one-round match, but a multi-pronged attack. A strong low pressure system over the Plains will slowly move northeast into the middle Mississippi Valley over the next 24-36 hours. Ahead of it, gusty southerly wind is drawing up warm, moist air from an abnormally warm Gulf of Mexico into the region. A cold front will take it's time moving across the lower Mississippi Valley on Saturday as the low anchoring it's north side weakens and slows down. This will set the stage for the potential for multiple rounds of thunderstorms, most in the form of lines or clusters, to move across the metro. This complicates trying to "time" the impacts. The first is a little more clear than the others and looks to march across Arkansas overnight, arriving along the Mississippi River in the wee hours of Saturday morning, likely between 2-4am as we see it now (early afternoon Friday). The line will encounter a slightly less unstable airmass as it reaches east Arkansas, but could still bring the threat of damaging wind, perhaps some hail, and an isolated brief tornado, as well as dangerous lightning and heavy downpours. The Storm Prediction Center divides their outlook periods by day ending at 7am CDT. So, through 7am Saturday, the western metro is in a Slight Risk (category 2 of 5) and the eastern metro in a Marginal Risk (category 1 of 5) for severe storms (see left panel of graphic below). Following the early morning round, which will likely be gone by the time many of you wake up on a typical Saturday, the metro will remain under an unstable airmass which could produce additional scattered showers and thunderstorms during the mid-morning hours. Strong south wind will continue to bring unstable air north and, as the front approaches, storms are expected to re-generate during the late morning and afternoon hours. Timing these will be very difficult until they pop up on radar, so simply be prepared for the possibility of rain and storms just about anytime Saturday. The cold front finally moves through sometime in the late afternoon hours, ending the storm threat. The front could also be accompanied by strong storms, though it's more likely that if a squall line forms it will be just east of the metro (again, making timing difficult). The SPC severe weather outlook for Saturday during the day (right panel in the graphic above) places east AR under a Marginal Risk (1/5) and west TN and north MS in a Slight Risk (2/5). Late morning and afternoon storm threats include primarily damaging wind, lightning, flash flooding in areas that get multiple storms, small hail and a low threat of tornadoes. 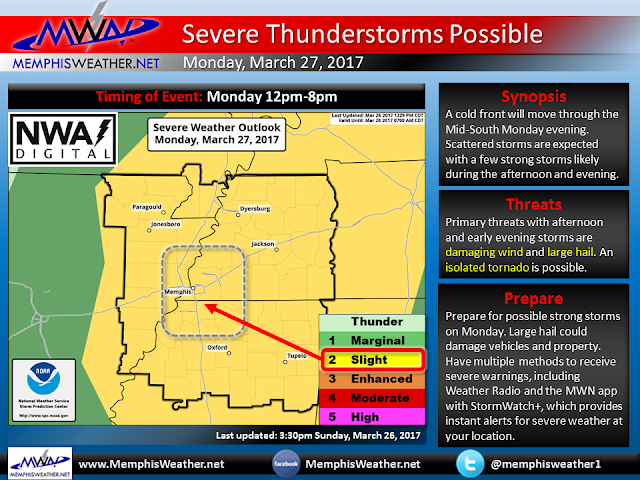 Sunday looks to be a warm, pleasant day then another round of storms is expected on Monday (potentially any time on Monday) with severe weather again possible. More on that later this weekend. I'll wrap this up with an animation of the mid-level pressure/wind pattern for the next 10 days (through Sunday March 26) below. You'll notice that there are multiple "waves" of pink/red that move across the southern U.S. (at least 4 of them) during that 10 day window, all indicating the likelihood of a round of storms and any capable of producing severe weather somewhere along their track. It's spring and an active pattern has set up. It'll pay to stay close to your favorite weather sources and always have the latest information on the next storm system, as that information will change or be refined as each storm approaches. Wind/pressure pattern at 18,000' (500 mb) over the CONUS through March 26, showing multiple "waves" of weather moving across the Mid-South, each capable of producing storms, a few strong to severe. Click here if the loop doesn't animate. Graphic courtesy PivotalWx. 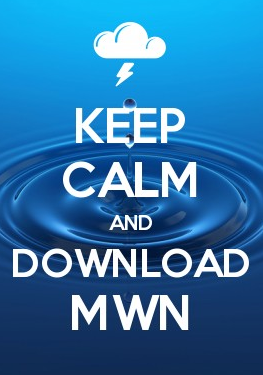 Get the latest information from MWN at the links below, including our social media feeds, website, this blog, and our mobile apps. 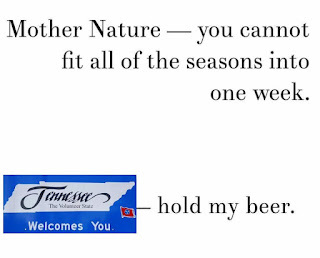 Here's the current forecast, generated by a real meteorologist (me) and not a computer. 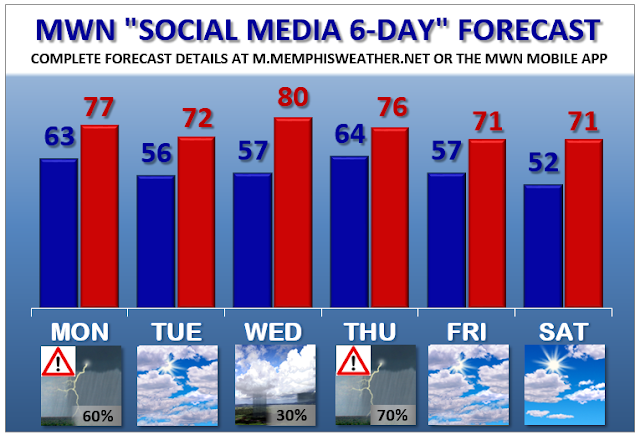 StormWatch+ should be your friend as we enter our primary severe weather season! Stay safe! 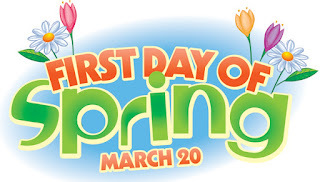 Today is a chilly reminder that, despite clocks springing forward tonight and temperatures being in the 70s two days ago, spring doesn't officially start until March 20 and the average last freeze of the year isn't typically until March 19. We may not end up missing it by much this year when all is said and done! It looks like we'll have one last chance at winter precipitation tonight as a chilly day gives way to falling temperatures this evening that reach critical thresholds in the snow-making process by late evening. 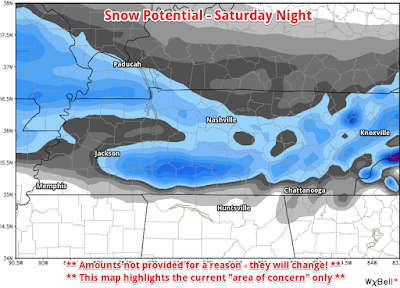 Though not expected to be highly-impactful locally, Mother Nature reminded us this morning that sometimes she has a mind of her own, dumping over 4" of snow up near Paris, TN! Closer to home, light rain showers will continue to move over the area this afternoon with temperatures in the lower 40s and wind chills in the mid 30s thanks to a biting wind. As the sun sets tonight, temperatures will fall into the 30s as one last round of precipitation moves in from the west-northwest, pushed ahead of an upper level disturbance. It's this round that poses the risk of wintry precipitation. It appears that rain will transition to snow, perhaps with some sleet mixed in briefly during the transition process, between 6-10pm from north to south. The wintry precipitation won't last long, perhaps a couple hours. 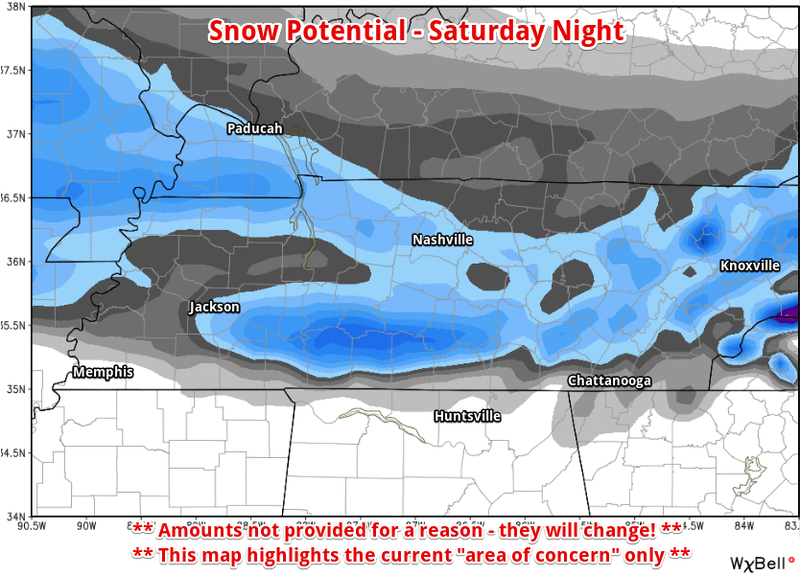 Though some morning models indicate that a brief "burst" of snow could occur late this evening, the latest high-resolution model data is indicating that precipitation might be tapering off as the critical temperatures are reached, limiting the potential for any major issues. 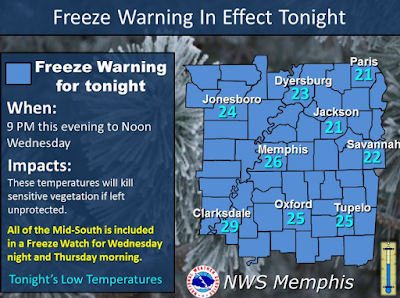 It does appear that by midnight, any snow will have ended with temperatures still at or above freezing. I don't expect any significant travel issues overnight or in the morning on local roadways. Accumulation chances are highest in Tipton County in the metro and drop as you go south. Even then an inch in grassy areas would be the most I would expect, again mainly north of the immediate metro. 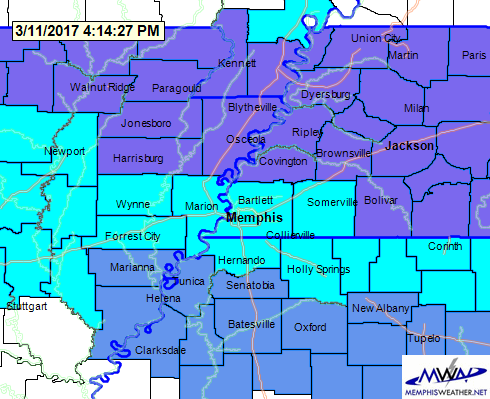 A Winter Weather Advisory has been issued for Tipton County where the best chance of measurable precipitation exists. Why: Because you've already mowed and the tulips are lovely! Looking ahead, brace for continued chilly "late winter" conditions this upcoming spring break week with high temperatures that average some 10-15° below normal and a few mornings that could see frost or a freeze. The most likely mornings to approach conditions that could harm early budding trees, bushes and flowers are Sunday, Wednesday, and Thursday as a reinforcing shot of cool air arrives behind another upper level disturbance that brings additional rain chances on Monday. 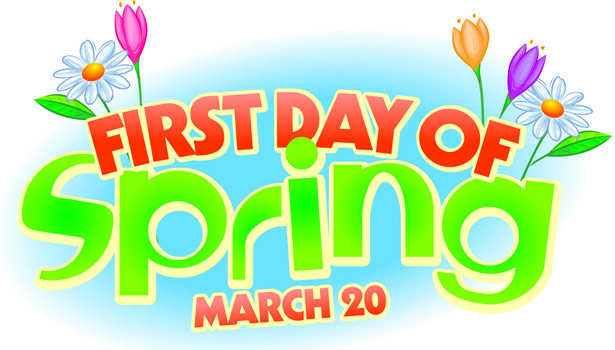 Lastly, one more reminder that tonight ends Standard Time and we "spring forward" to Daylight Saving Time at 2am Sunday! You'll lose an hour of sleep and an hour of daylight in the morning, but get a later sunset that many people seem to favor, especially heading into spring!